My introduction for readers to ‘Pike’ was with an article* about her on 1st June. Richard Green in the Comments section posed the question, “Does it hinge across the middle?” I replied that I would explain how it works. The photos more or less speak for themselves. The first one shows the rudder fully down. The second illustrates the halfway position, and the third depicts the rudder fully raised. 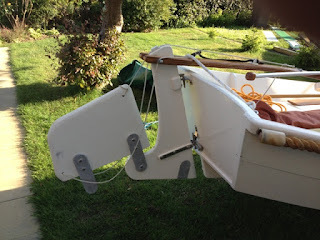 Technically, I don’t think the rudder should be left in the intermediate position, because the loop of the up haul line has no fixture on the tiller for it in that position, but there is a convenient hook for when raised. 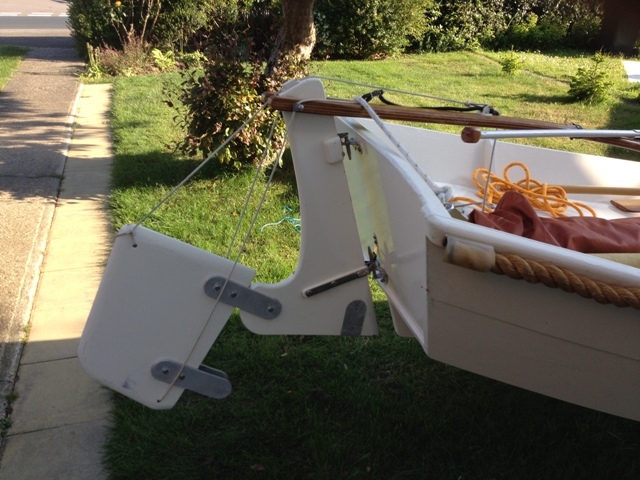 A double line, one either side of the rudder, is attached to a bungee under tension to keep the upper and lower parts together. To raise the lower part, one has to release the bungee from a hook on the tiller; then pull the up haul line. 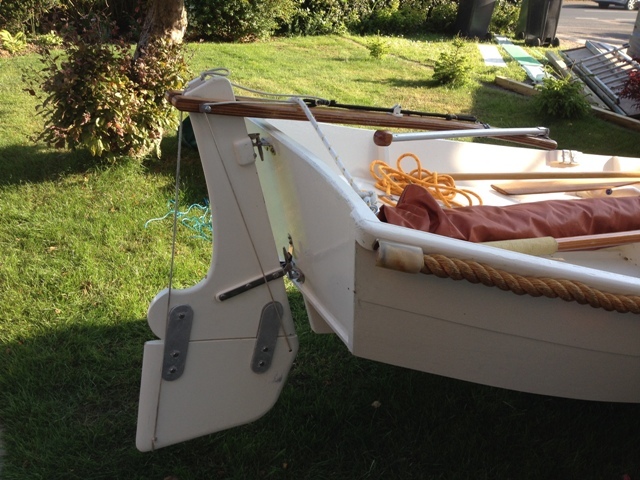 I don’t think this is the most elegant solution for sailing in shallow water, but it looks plausible. I’ll have to see how things actually work out. Hello Bill, the rudder certainly had me guessing. I think the only reason for that configuration must have been a need to economise or fully utilise the available materials. It may well be an idea to fire off an email to Ian Outered and ask him if its his design, and ask him for his reason8ng? 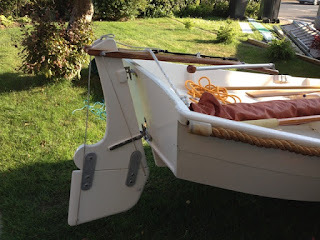 I shall give the rudder a try to see how it goes.